December 11, 2010 By Leroy Thompson & filed under All Articles, Rifles & Carbines, Weapons. When the Israelis decided to fabricate their own assault rifle to limit their dependence on imported weapons, the Galil was created as a rifle suited to the conditions in which the Israeli Army fights. The sturdy Kalashnikov design was used as a basis, though strictly speaking it would be more correct to say the Finnish Valmet was. Many of the features that are less desirable on the AK were improved on the Galil. For example, instead of the uncomfortable top folding stock that rattles on the AK-47, the Galil incorporates a comfortable side-folding stock. On the negative side with that stock, you must use two hands to unfold or fold it and have good hand strength. Other improvements included better sights, including flip-up Tritium night sights, and an improved safety. Elite Firearms 5.45x39mm Galil with AK-74 magazine in place and Wolf ammo. Although the long AK-type safety lever /selector is retained on the Galil, there is also a sliding safety comfortably located for operation by the thumb of the right hand. Operation of either safety/selector moves the other one as well. There were other improvements incorporated into the Galil to make maintenance easier, but I just want to give a quick overview. I became interested in the 5.45x39mm Russian cartridge early on. I was training U.S. Army General Officer Protective personnel to counter possible Spetsnaz assassination teams and needed to be familiar with the weapons and ammunition they would likely use. 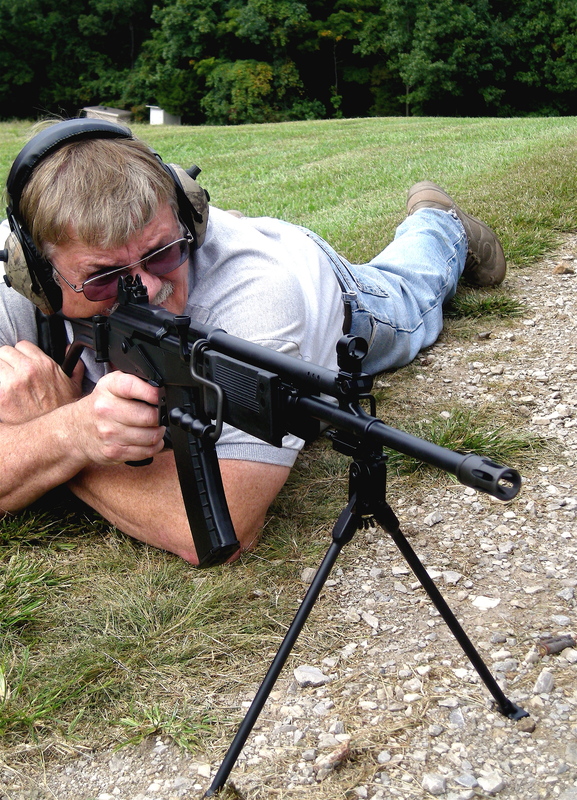 Thompson fires Elite Firearms ARM off the bipod. Due to terrain, he could not get behind the rifle fully, but bipod was still a great aid to shooting. I first got a chance to do a lot of shooting with the AKS-74 and AKSU-74 in Brussels a little over 20 years ago, when a former KGB Osnaz operator—who was working for a Russian arms dealer—brought the two weapons and a case of ammo to an indoor range on a Sunday morning for me to try. I put a lot of rounds through the AKS-74 paratrooper rifle and the AKSU SMG and became quite a convert. On full-auto fire, both were extremely controllable. Later, talking to contacts when I was in Russia and e-mailing Russian veterans, I found that they felt the 5.45x39mm round was really a pretty good stopper due to its bullet design, which caused it to tumble in flesh. So, the Galil using the 5.45x39mm round seemed like a good idea to me when Dave Michener of Elite Firearms told me that, based on the expertise he’d gained producing 7.62x39mm Galils, he was going to produce one in 5.45x39mm. The basis for the Elite Firearms Galil is a 4140 fully heat-treated receiver combined with Israeli or South African parts plus U. S. compliance parts. As mentioned previously, Michener also makes 7.62x39mm Galils, which use chrome-lined barrels. The 5.45x39mm version does not. As a result, it is recommended to use Wolf or other non-corrosive ammunition. Right now there is quite a bit of corrosive 5.45x39mm that has come into the U.S., but it’s easy to find Wolf or other Russian steel case 5.45x39mm at reasonable prices. The extractors used in the Elite Firearms Galils are designed to work with steel case ammo. The Elite Firearms 5.45x39mm Galil is offered with either a 16.5- or 18-inch barrel, though an SBR version with 13-inch barrel is available as well. With the 18-inch barrel, overall length of the rifle is 39 inches when the stock is extended and 29.25 inches when it is folded. 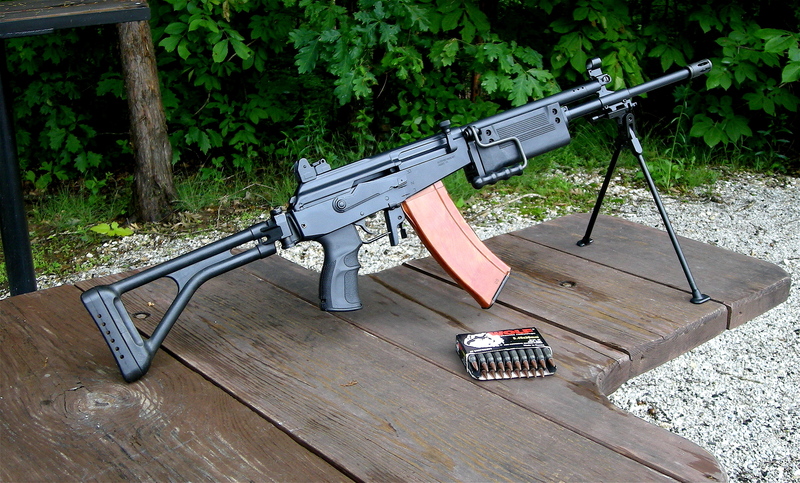 The magazine well of the Elite Galil will take any AK-74 magazine, including 45-round “Bin Laden” RPK-74 magazines. I’ve fired mine with every type of AK-74 magazine I have—which is pretty much every type there is—and it worked dandy with each. The feed ramp is riveted into the receiver and Michener uses a refined double-hook trigger system that gives a smooth pull without the overtravel common with Galils and AKs. My experience has also been that Galils often have a lot of trigger slap, but I did not notice this on the Elite Galil. Michener offers some options, such as polymer or wood furniture and AR or ARM configuration. The AR configuration is the basic assault rifle version, while the ARM version is based on the light machine gun version of the Galil and has a forearm designed to take a folding bipod. Although I normally prefer the AR versions of Galils, I ordered the ARM version of the Elite Firearms 5.45mm with polymer furniture. Its finish is Black Diamond Coat. I’ve been happy with my choice. 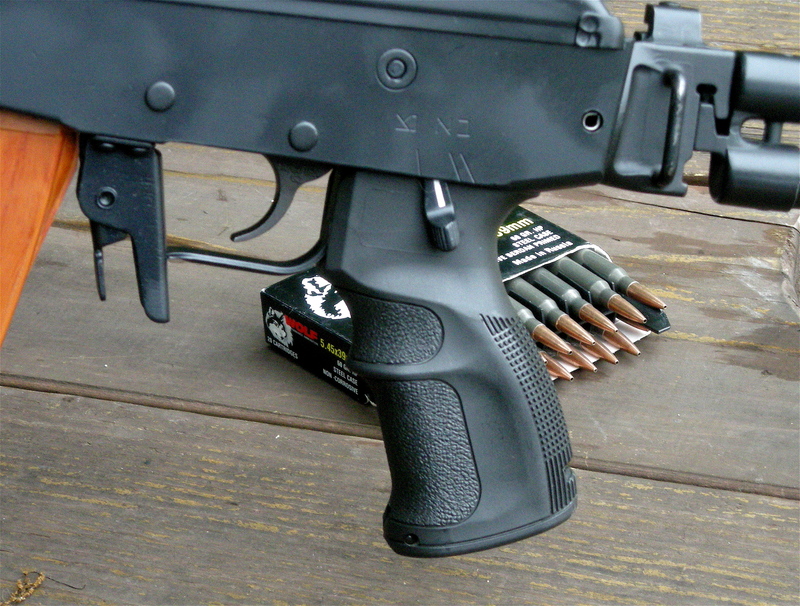 Enhanced Galil pistol grip Dave Michener uses on his Galils, and sliding safety that makes operation much easier. Michener keeps original Hebrew markings. As I have depleted my supply of “inexpensive” 5.56mm and 7.62mm NATO ammo over the last couple of years and not replaced it due to high prices, I’ve been shooting the 5.45mm Galil quite a bit. As usual when shooting Galils, I find the flip-up rear peep sight, which has apertures for 300 and 500 meters, not optimal. I would prefer a 200-meter peep for the closest one. Still, I’ve gotten used to it and still shoot it more at 200 meters than 300 meters. As with an AK, windage and elevation adjustments are via the front sight, so you need an AK sight adjustment tool to change elevation easily. At 100 yards, my five-shot groups with Wolf 5.45x39mm 60-grain ammo were in the four-inch range. Given that 5.45x39mm does not have a great reputation for accuracy and that my eyes are getting old for open sights, I didn’t find those groups particularly disappointing. I did most of my shooting at 100-, 200- and 300-yard plates once I had the sights on. The Elite Firearms Galil handled well and allowed me to move among plates quickly, especially when I did some shooting on plates at 35 and 50 yards. I deployed the bipod and shot prone and found that it was definitely an aid in hitting the 200- and 300-yard plates. I always found working an AK’s safety a little uncomfortable when shooting prone, but not so with the Elite Galil because I can use the smaller push lever. Michener uses the latest style Galil pistol grip, which is more comfortable than both the older type and AK pistol grips. Also as advertised, trigger pull is really pretty good—another aid to accuracy. I’m past 1,000 rounds through the Elite Galil and am still very happy with it. It’s one of the rifles that stays in the front of the safe because I shoot it a lot. Dave Michener is a craftsman and his rifles show this.